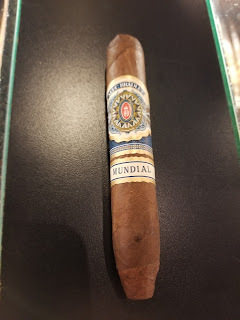 Background: Alec Bradley's offering is named Mundial, which means global in multiple languages. It took them five years of blending and putting together four different fillers to get the blend just right, which only comes in a perfecto shape. 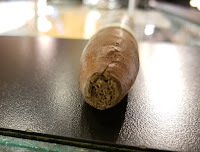 Appearance (0-20): Characteristic of Alec Bradley, there are two bands that dominate the cigar. One band is oversized and contains the Alec name, logo, and a focused design that utilizes pearl, gold, and blue hues that are set across a compass / the sea. The secondary band gives the name of the cigar - the Mundial - without any additional fanfare, but still keeping with the same color scheme. The cigar beneath has a lighter Honduran wrapper with a couple of small veins and blemishes. Overall the shape and look is nice and well thought out, but not perfect. Construction (0-20): Perfecto cigars aren't the easiest to produce, which isn't evident from the first glance on this. It looks well constructed and feels that way too. Aside from a small crack at the foot, there is nothing negative to note about this oily stick. The wrap is tight and there are no discernible areas where it may be under or over packed. The cut was relatively clear, and the burn was both straight and solid. I did, however, run into a bit of a problem about two-thirds of the way through, as the wrapper on it totally unraveled. Disappointing given how well constructed it was otherwise. 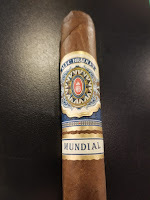 Strength (0-20): The Mundial is listed as a medium strength and is absolutely right on that throughout the smoke. There is very little in terms of deviation from that. Flavor (0-20): There is no doubt that when you spark this up you'll find a nice cedar base with some chocolate and pepper. The sweetness is a nice balance to the heat, which also comes through on the retrohale. As you continue, you will catch varying hints of earth, leather, nuts, and even something akin to butter. None of the additional flavors are long lasting, but will pop in from time to time. This definitely has some really nice complexity. Value (0-20): For a small perfecto like this, its a bit pricey, but the flavors are there. 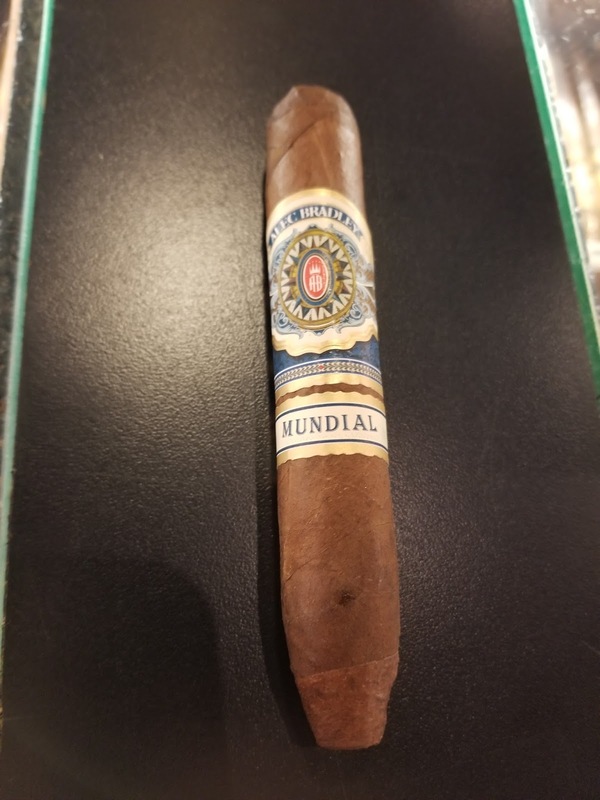 I can't call it a bargain, but I will say its priced competitively with other quality smokes. Additional Notes: Paired with water. Cigar provided by Holt's Cigar Company. 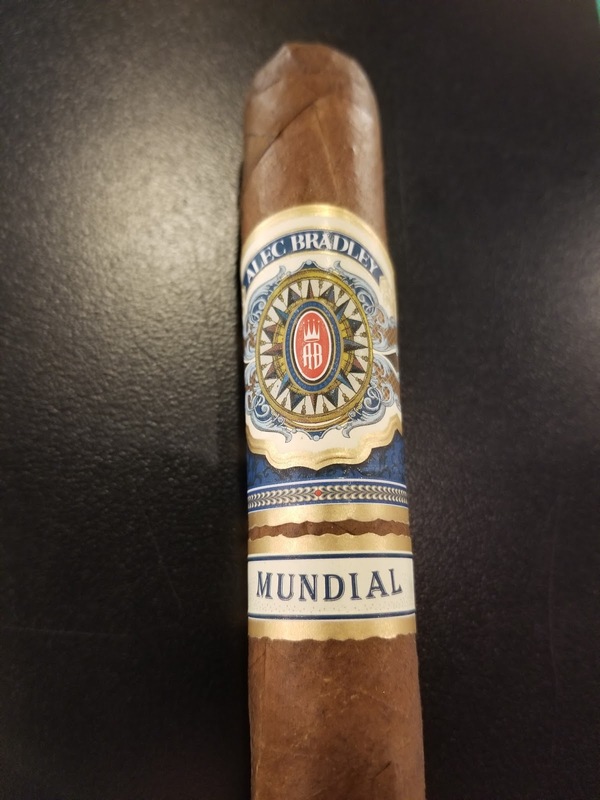 Overall (0-100): Overall, we have had some decent success with Alec Bradley products across the history of our site, and this one sticks right up there with the rest. It isn't the best stick I have had, but the majority of that issue comes from the fact that it fell apart toward the final third. It is a real shame too, since its a complex smoke that otherwise checks all of the boxes. 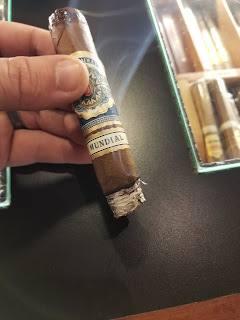 These are for sure worth trying since its a straight up medium smoke with good core flavors (cedar, chocolate, pepper), a good appearance, and a fair price. Hopefully yours doesn't unravel - because this would have been a few points higher if it would have stayed wrapped.